Artem Lobov has always been a citizen of the world. A native of Russia who makes his home in Ireland, Lobov’s fighting passport includes stamps from the United States, Poland, England, Sweden, Scotland, Jordan, France and Ukraine. But never Canada. Until now, when “The Russian Hammer” faces Michael Johnson in the co-main event of the October 27 card in Moncton, New Brunswick. And truth be told, while this will be a co-main event in a place he’s never fought in before, as far as Lobov is concerned, any fight anywhere on a card against any opponent would be just fine with him. It’s been an interesting stretch for Lobov since his October 2017 loss to Andre Fili. Scheduled to return in April against Alex Caceres, Lobov was pulled from the card after an altercation with Khabib Nurmagomedov on fight week led to teammate Conor McGregor’s much publicized bus incident in Brooklyn. Then scheduled for a Moncton meeting with Nurmagomedov’s teammate Zubaira Tukhugov, Lobov saw that bout fall by the wayside when Tukhugov was removed from the bout. Now Johnson is in, and Lobov is just happy to be able to punch somebody. Of course, the bad blood between the Lobov and Tukhugov camps added a layer of intrigue to next week’s event, and the 32-year-old won’t deny that he had a point to make in the Octagon. Given what happened before and after UFC 229, though, it’s probably for the best that neither team is around each other anytime soon, and that the focus switches to what happens in the Octagon, and not on anything else. 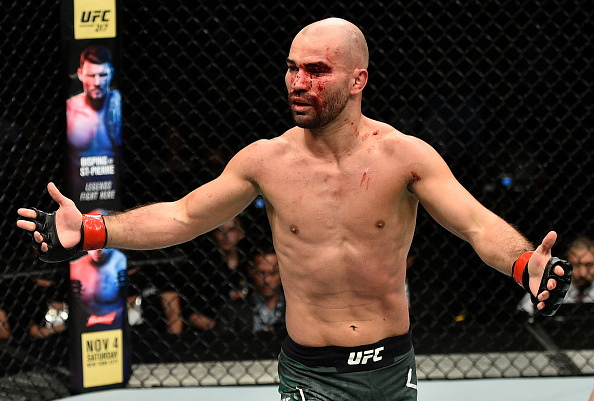 Lobov is fine with that, because fighting in the Octagon is the only thing he wants to do. He’s an old-school battler, and when I joke with him that when fighters say they would fight for free, he would actually mean it, he laughs. He’s not fighting for free anymore. But the gritty mentality stays unchanged. Even with a year out of action, he’s staying sharp the way fighters do. And in a few days, the wait is over. Artem Lobov gets to breathe again.